Network designs can take many forms and may vary in terms of performance and security. Network switches allow devices such as network cameras, servers and PCs to communicate with each other to share information and, in some cases, a common Internet connection. First, determine what your company is using the network for and how congested your local area network (LAN) or wide area network (WAN) is. If you are implementing a smaller surveillance system involving 8 to 10 cameras, you should be able to use a basic 100-megabit (Mbit) network switch without having to consider bandwidth limitations. 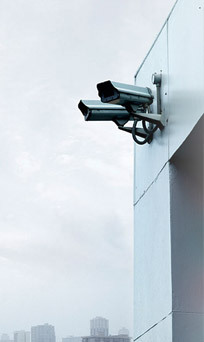 Most companies can implement a surveillance system of this size using their existing network. A camera will use approx. 2 to 3 megabits of bandwidth when configured to deliver high-quality images at a high frame rate. With more than 12 to 15 cameras, you should consider using a switch with a gigabit (Gbit) backbone. If a gigabit-supporting switch is used, the server running the video management software should have a gigabit network adapter installed. Determine the pattern of congestion levels over a given period to find out if you have to install additional bandwidth capacity on your network or whether you can make use of the same network as for general business activities. It may be that the network traffic drops off during nighttime and weekends—the times when you may want to activate the surveillance system. It may be that the network traffic drops off during nighttime and weekends—the times when you may want to activate the surveillance system. 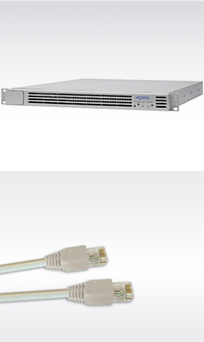 use a combination of existing general purpose network as well as a new network for IP-Surveillance. If additional network capacity is needed, new cabling is normally not needed since adding a switch or reconfiguring the patch panel may solve the problem. The higher the resolution, the more bandwidth is required. Motion JPEG often requires more bandwidth than MPEG-4. The higher the compression, the lower the bandwidth usage. The higher the frame rate, the higher the bandwidth usage. The above criteria can be set either in a video management software or in the network camera or video encoder product itself. A simulation-based calculators helps to provide guidance on a network video product’s bandwidth and storage requirements based on the five criteria mentioned earlier. You can reduce the use of bandwidth if you record only when motion or alarm is detected compared with continuous recording. The most efficient use of bandwidth and storage space is if you set a video management software to record using built-in video motion detection. When running a cable between a LAN and a network camera is impractical, difficult or expensive, a wireless solution using a wireless access point — also called a device bridge or wireless router — is a good option. Wireless technology can be useful, for example, in historic buildings where the installation of cables would damage the interior; within facilities where there is a need to move cameras to new locations on a regular basis, such as in a supermarket; or in outdoor installations. Wireless technology can also be used to bridge sites without expensive ground cabling. Securing a wireless network should be addressed. Otherwise, everyone with a wireless device present within the area covered by the network will be able to participate in the network and use shared services. Since wireless routers do not have the same bandwidth capacity as a normal switch, no more than four to five cameras should be connected to a wireless access point.